A target market can be a specific neighborhood, income, or age of the home. Deciding who is your target market is very important to your direct mail success. Mailing to the right people who are more likely to buy your product or service is the best way to spend you advertising dollars. A strong offer goes a long way to getting people to call or come through your doors. Add an expiration date to cause a since of urgency and get your potential customers to call or come in sooner versis later. A well-designed ad is non cluttered, but is easy to read and gets your point across in 3 seconds are less. Everything from the design to the paper and print quality is an extension of your business image and should all be taken into consideration. When you consider these 3 factors as a whole, you will reealize one will not be able to work with out the others. 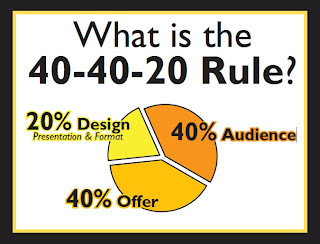 Each factor should all be taken into consideration when putting together a marketing piece. 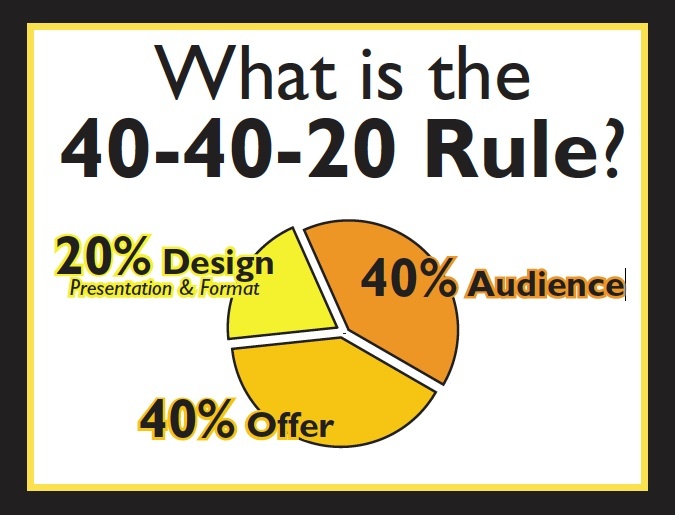 Feel free to let us know how you have used the 40-40-20 rule in your advertising. Are you going to write about Adwords and Facebook ads. these can go a long way and can meet demographic requirements.